I have made it to Arizona, my 14th state of this trip and only California is missing! But let me summarize the last couple of days on the road. 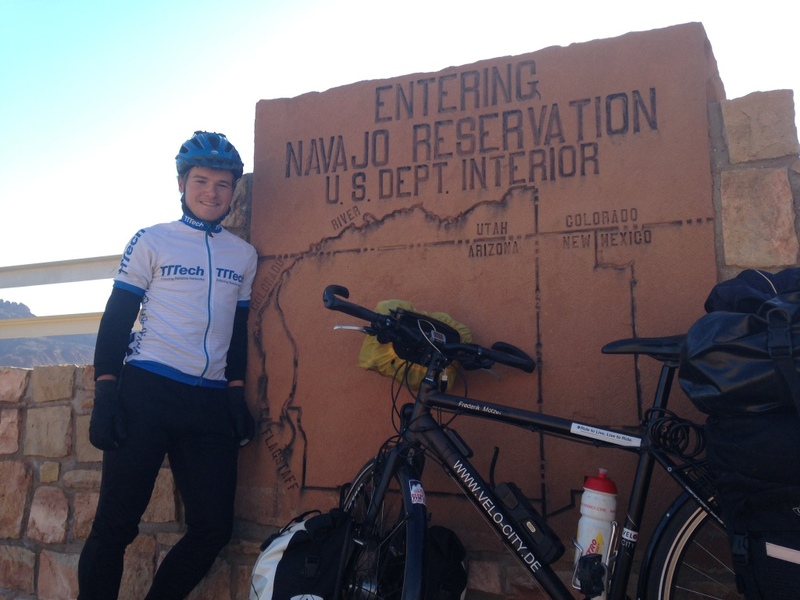 After two relaxing days at Pete’s and Tina’s house in Boulder, it was time to get on my bike again. 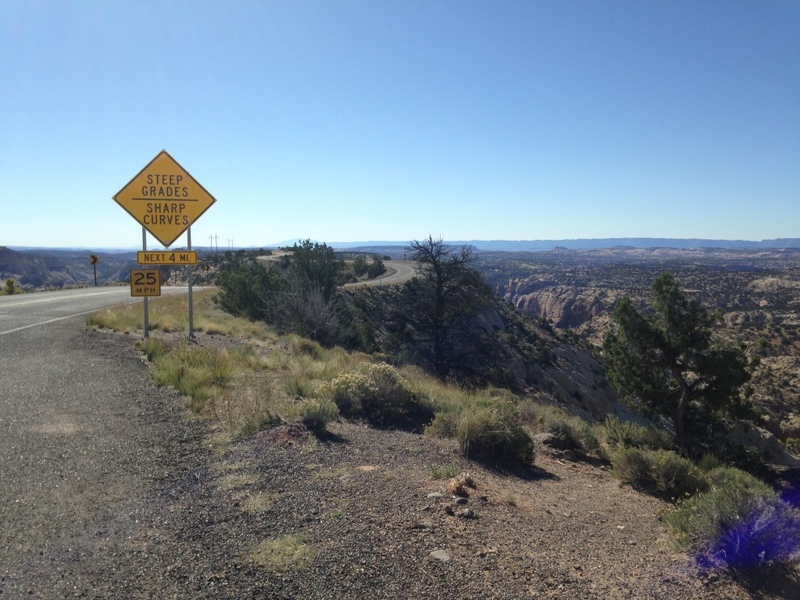 Right after Boulder, I had to ride on the ‘Hogback’, which is a narrow road that has canyons on both sides of it. The day before I rode on it in Pete’s car and therefore knew what I was getting into. But it was way scarier in a car than on a bike since you don’t go as fast and there was some space on each sides before it went steep down. Apparently they have redone the road several times and it’s less dangerous now. I tried to take good pictures and capture the drop-off to both sides, but since I couldn’t just stop in the middle of the road, I’m not sure if it worked. 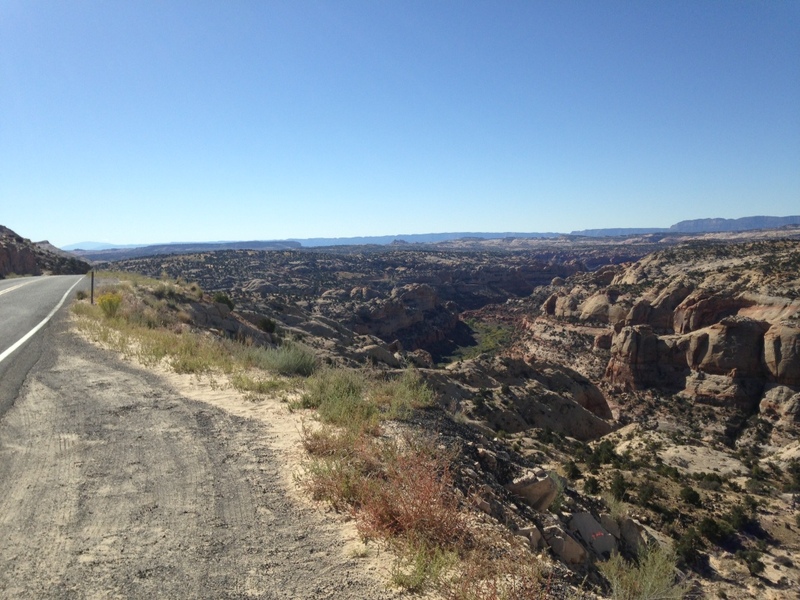 After a long descent with beautiful views into the canyons, I got to the Calf Creek Campground which is a popular spot for hikers. Since it is owned by the federal government it, and even its parking lot, were closed due to the government shutdown but there were still a lot of cars parked on the road. Pete and Tina had recommended to hike down to the waterfall. I left my bike at the entrance and started walking, but realized that it was a long hike (about 10km) and since I knew that I still had climbing on my bike ahead of me I decided to get back at my most important task on this trip: pedaling. 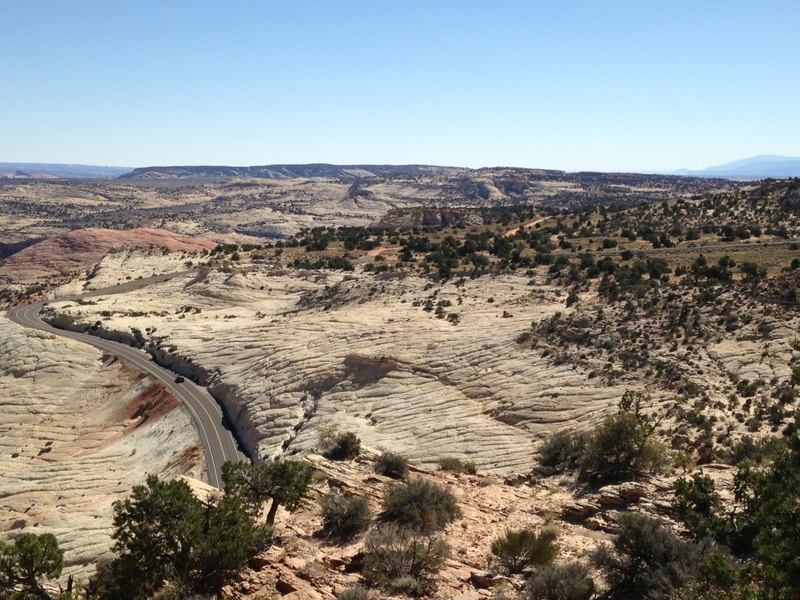 It was a good decision not to hike, since the climb before my destination in Escalante was a tough one. 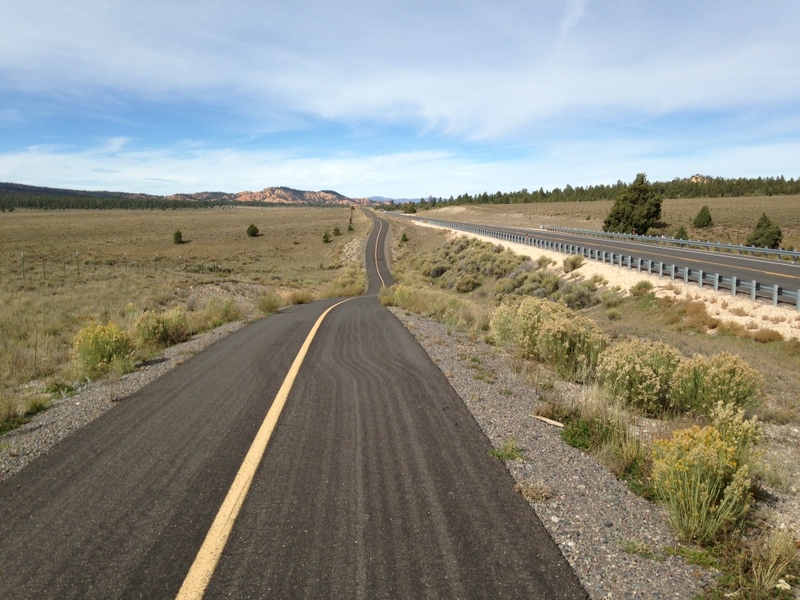 Long stretches with 8% and a couple of switchbacks. 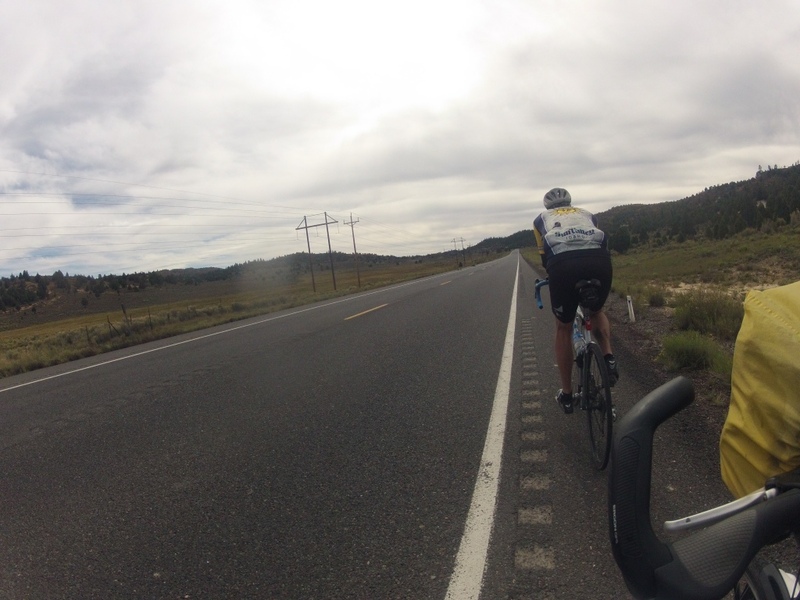 During the climb, I passed Dave and John who were on their racing bikes and taking a break. Their wives were driving the support vehicle and they didn’t have to carry anything, except for themselves, up the mountain. I talked to them for a while and at the top of the mountain, ran into the support vehicle and its ‘road angels’ again. They invited me for lunch and I had some fresh fruit, cheese and crackers and delicious homemade cookies! The four have been friends for almost 50 years and it’s the 8th year they do a trip like this. 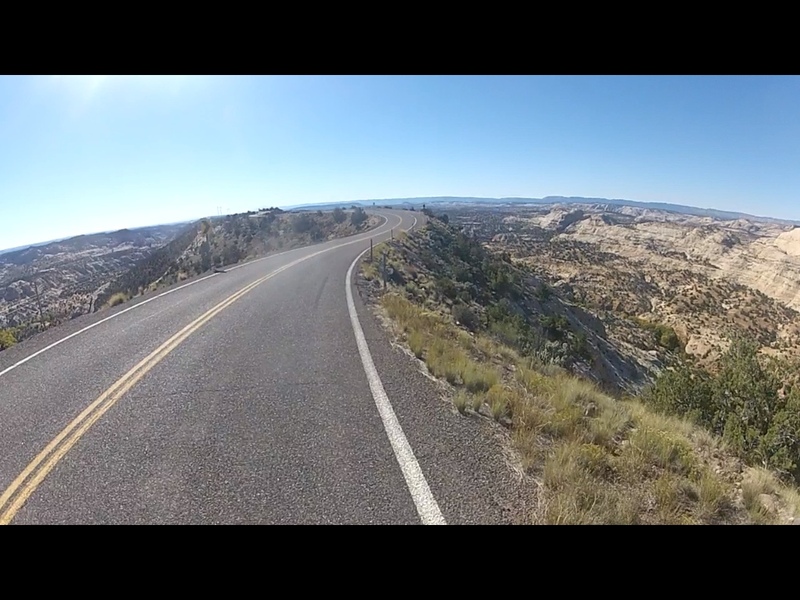 On the following downhill, they were faster with their racing bikes, but we caught up in the town of Escalante again where I was spending the night. The campground was really nice and thanks to a cyclist discount, I only had to pay 50%, meaning 8$. After getting my shopping done, it was yet another steep and exhausting climb with beautiful views. 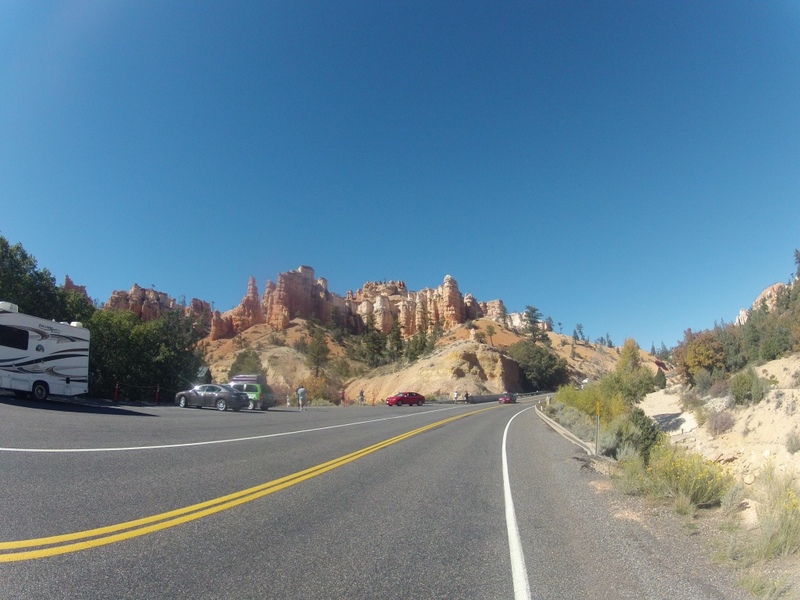 It’s a shame that all the national parks are closed, because I would have loved to see Bryce Canyon. I was spending the night just a couple of miles away from it but noone was allowed in. At the campground, I met another nice guy from Vancouver in his huge RV. He invited me to have a beer with him and gave me some cheese for the next day and helped me out with some milk and butter for my Mac&Cheese dinner. He had come all the way from Canada to see the national parks and now he was forced to just sit at the campground and find alternatives. The night at Bryce was the coldest of my trip so far. Minus 5 degrees Celsius and I was glad to have good equipment and several layers of warm clothes. The good thing is that it warms up quickly as soon as the sun goes up. 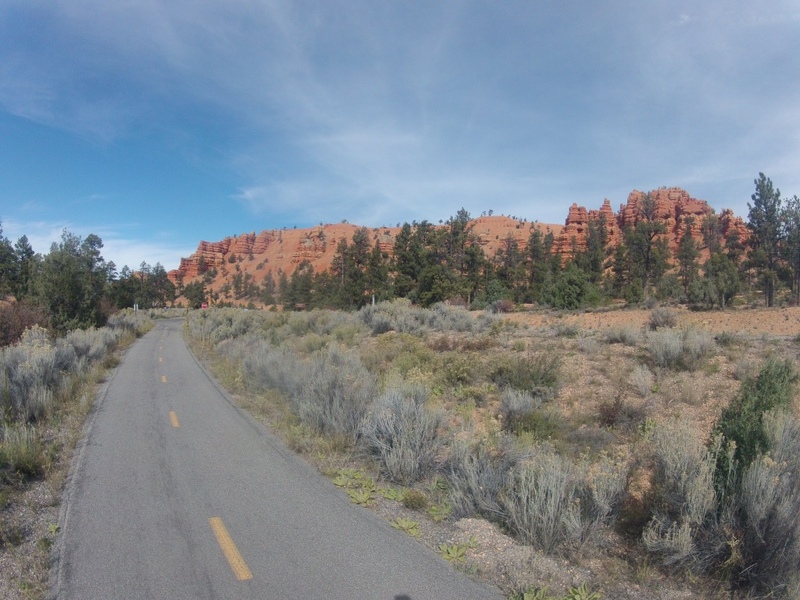 I made my way from the campground on a bike path (yes, they exist in the US sometimes) through the Red Canyon. Impressive views, but unfortunately also a lot of tourists, since it was one of the few attractions that isn’t a national park. 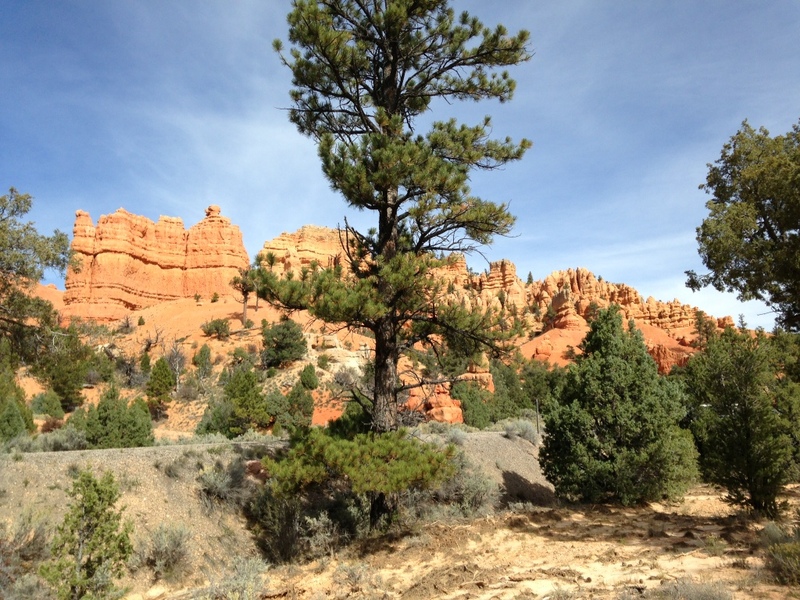 Red Canyon – amazing how the landscape completely changes with a “clear cut” as seen in the last picture! 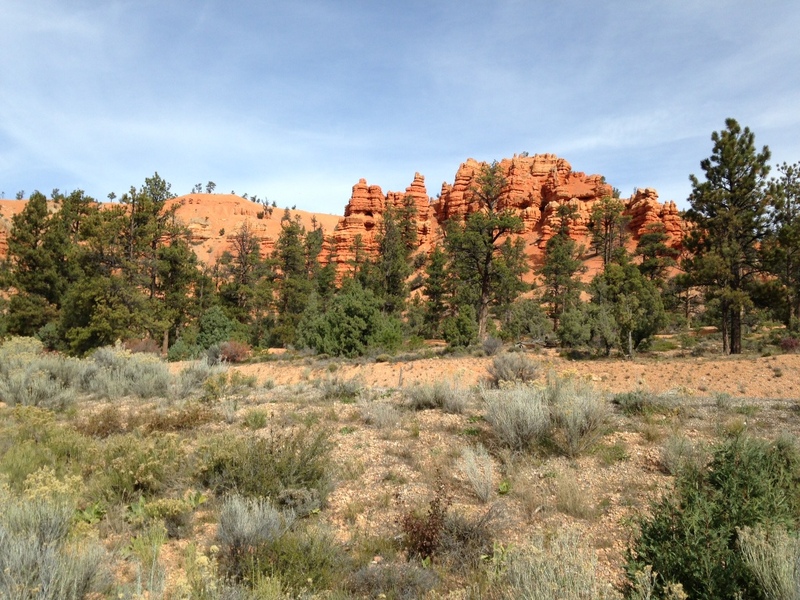 After leaving the Red Canyon, I saw two cyclists behind me and waited for them – it was Dave and John again and they invited me to lunch a second time. 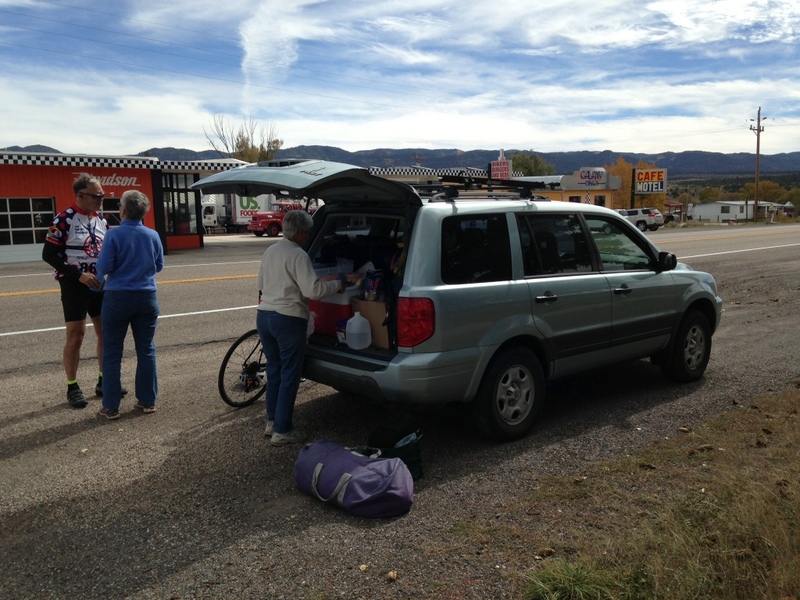 We stopped in the little town of Hatch where the support vehicle was and grabbed some snacks. When we were about to leave, we saw another touring cyclist in the distance – Tim, the guy from Seattle who I had stayed with at two different hosts on my trip already. We talked for a while and then left Tim who was getting a coffee in town. The three of us climbed up to the last pass of the day and were struggling in the wind. I was lucky and got to ride behind them the whole time which made it a lot easier – I felt like I was wearing the yellow jersey in the Tour de France and my teammates were supporting me. In Glendale, they stayed at a bed and breakfast place and unfortunately I won’t run into them again on the road as they are flying back home soon and taking a different route. I’m going to miss the company and the lunch provided by the road angels -Thanks for that! I spent the night at Gary’s place in Orderville. He is another warmshowers-host and a different one. He is 58 and lives in a trailer on the local campground. He hasn’t lived in the same place for more than a year in 40 years and loves nature and travelling. 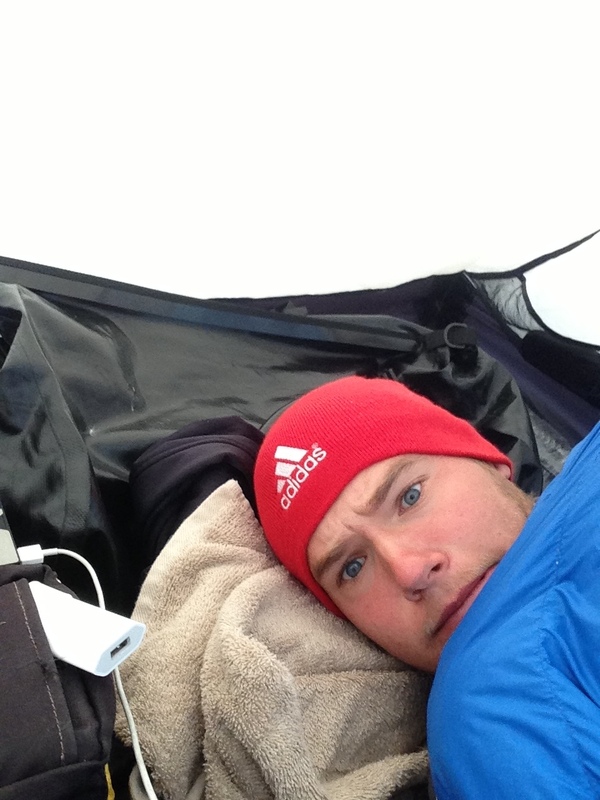 Tim, who also stayed there with me, described him as a modern mountain man. Right now, Gary works as a cook in a nearby restaurant, but just to save up some money and travel the next 5 years again. It is a fascinating lifestyle and he really only has the things he needs on the road. Cooking dinner therefore became a challenge since he also only owns a small camping cooking pot. So we each used our own pot to cook up some pasta. With three people, it did get pretty crowded in the trailer, but it was fun listening to all of the crazy stories Gary had to share and the night was warmer than the last nights in my tent. The next morning, we all biked down to Gary’s restaurant at 7AM. Gary was meeting a friend there to go hiking for a couple of days. 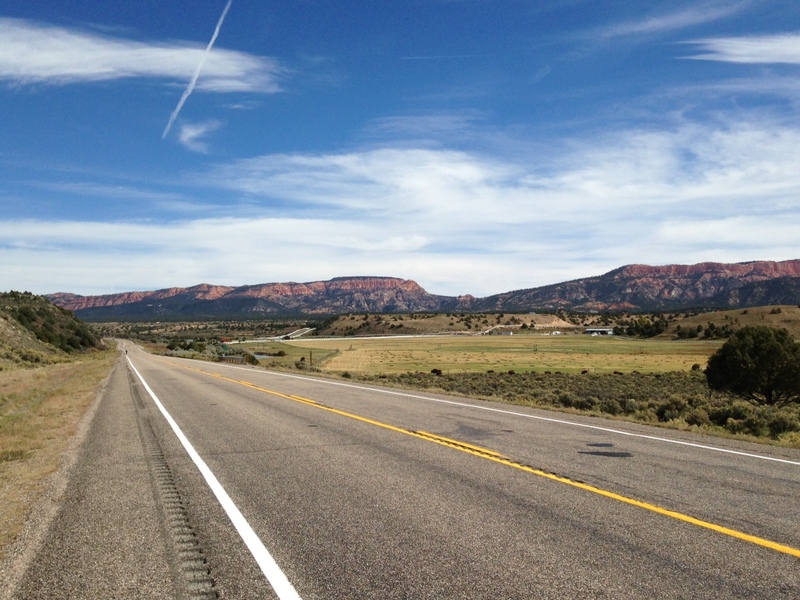 Tim was going west to St. George to fly home – his knee is still hurting and he decided to stop before it got worse. 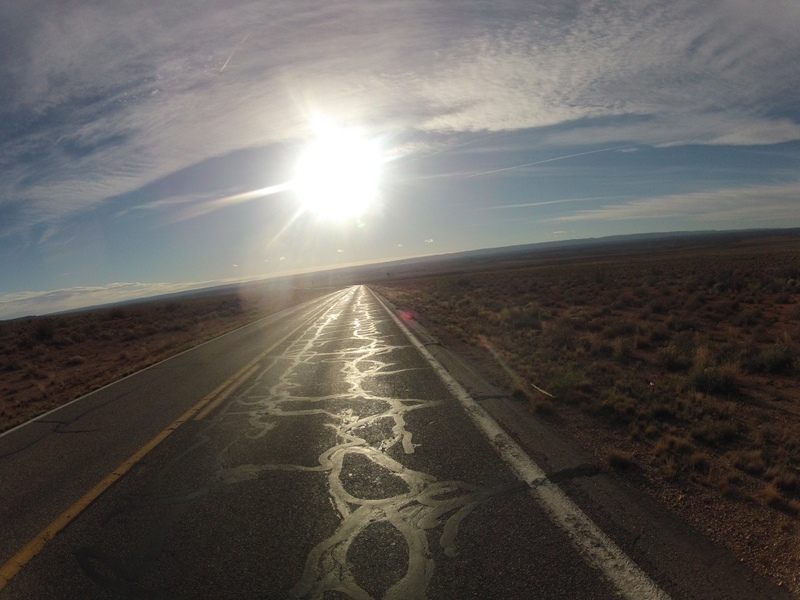 And I was going south towards Arizona and the Grand Canyon. The bikeride to the restaurant was one of the toughest of the whole trip. It was 8km in -3degrees. The wind was icecold and my hands were about to fall off. I couldn’t feel them anymore when I got to the restaurant and it took 30 minutes and 2 hot chocolates to feel alive again. The breakfast was really good and I only had about 30km to go that day. 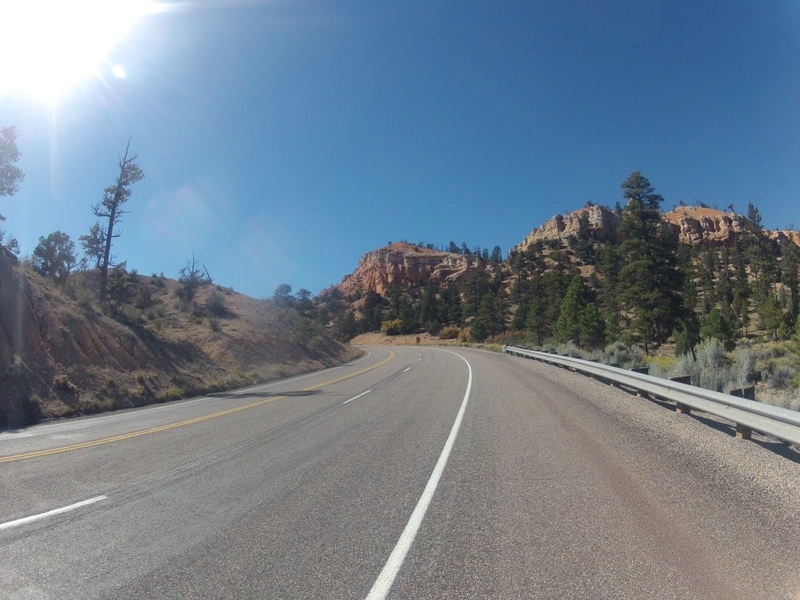 On my climb over the mountain to Kanab, I met a lady from Australia on her bike. 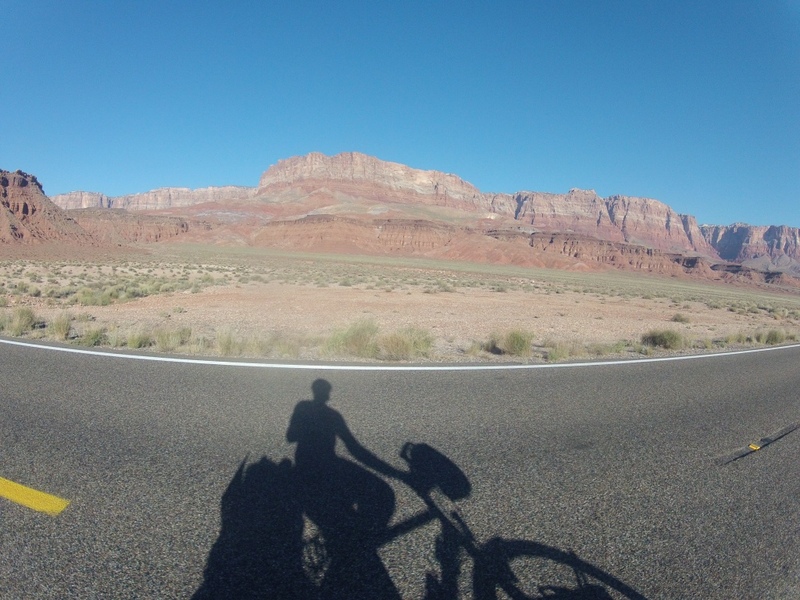 She had come all the way from down under for a weeklong biketrip through all the national parks in southern Utah – and they are all closed. I felt so bad for her! 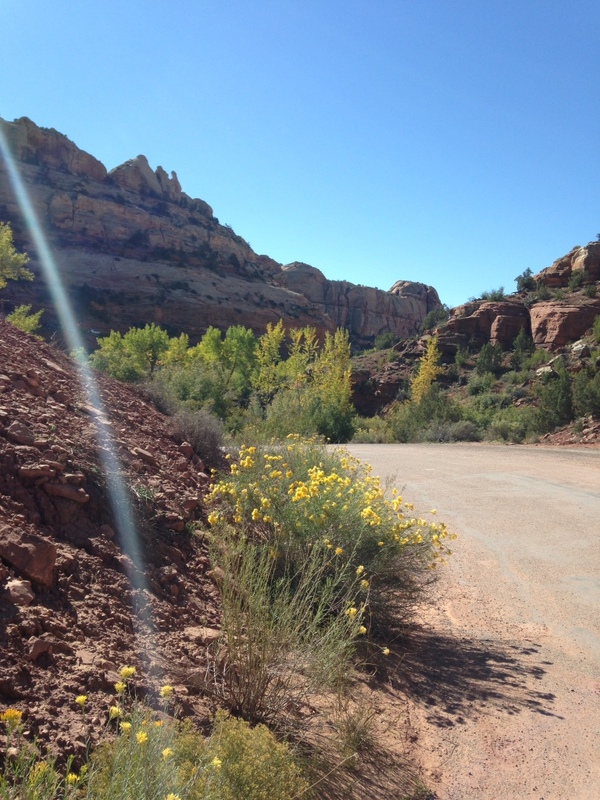 I got to Kanab at 11.30 in the morning and was excited to have a full day ahead of me in such a huge city (3500 people and several restaurants). I got to the campground, pitched my tent and saw an all-you-can-eat Pizza place nextdoor for 5$. I was in heaven! The whole trip I have been dreaming about all you can eat buffets and now it was next door. I stayed there for about 2 hours – the only downside was that I was feeling pretty full and sick afterwards, but I just had to take advantage of this opportunity. Besides eating, I also did my laundry and went grocery shopping for the next couple of days. 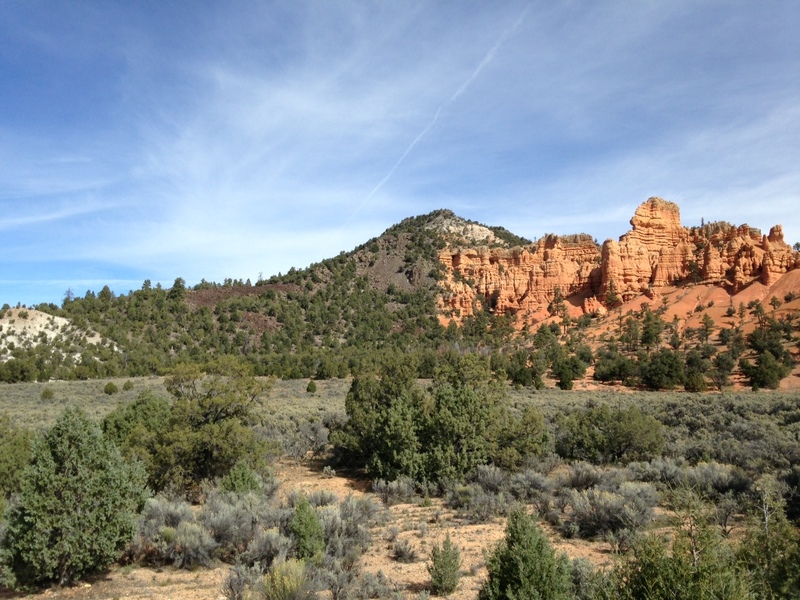 My plan was to leave Kanab really early as there were another two or three windy days coming up. Every time the weather changes from hot to cold or vice versa, this area gets really bad winds and it’s not a good idea to be biking. I left at 7.45AM and the day turned out to be not bad at all. Had one really long and tough climb up to Jacobs Lake, but then it was all downhill and the wind was not as bad as I had expected and coming from the side. 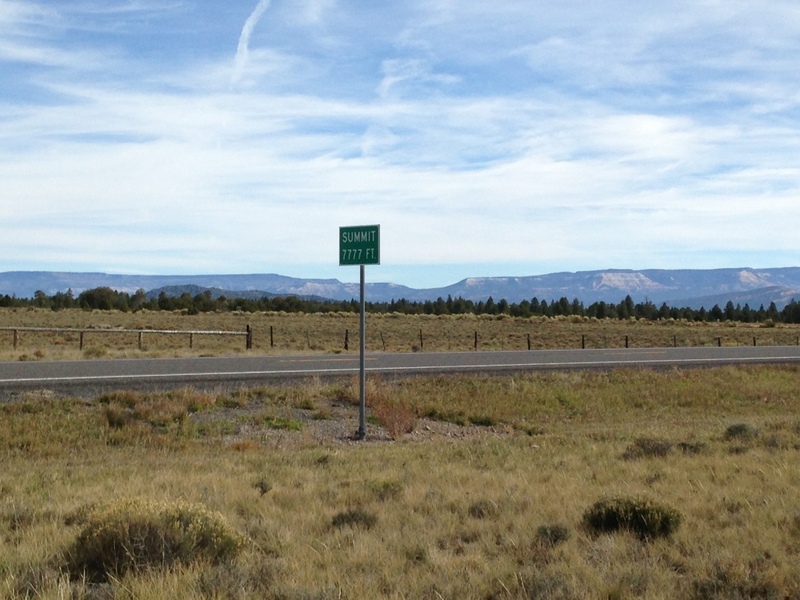 The only disappointing event of the day was the crossing of the Arizona state line. There was no colorful sign, but jut a little green one stating that I was in Arizona now. Since I figured there would be a bigger one coming up, I passed it without taking a picture. Besides that, the day was great. Had impressive views over the wide-open valleys and it’s just fascinating to be cycling through such country – no people or even signs of people for miles and miles. Funny that I did find a couchsurfer in one of the three settlements here (settlements in this case means: a restaurant/lodge and a couple of trailers where the employees live). Eran is 31 and from Portland, Oregon. 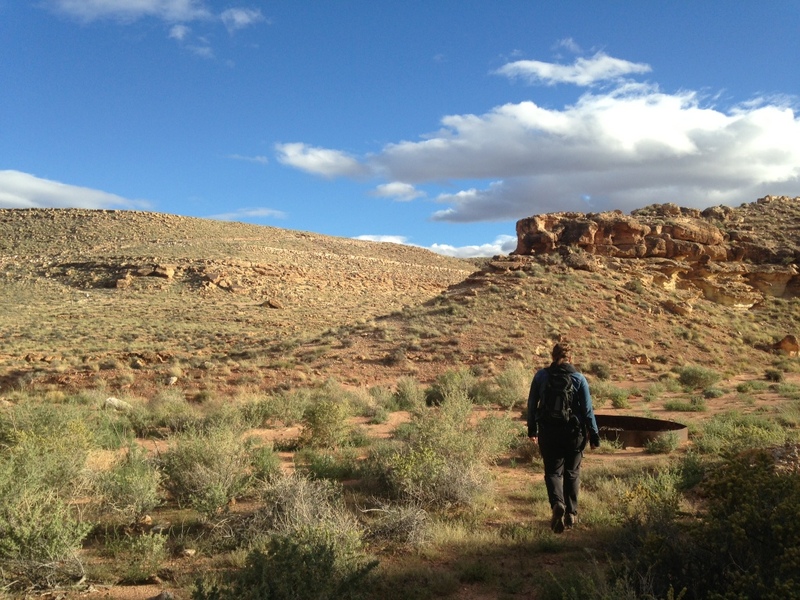 She moved down here to work in the office of the lodge and loves hiking in the area. She took me on a little hike and it was cool to explore the non-touristy stuff. 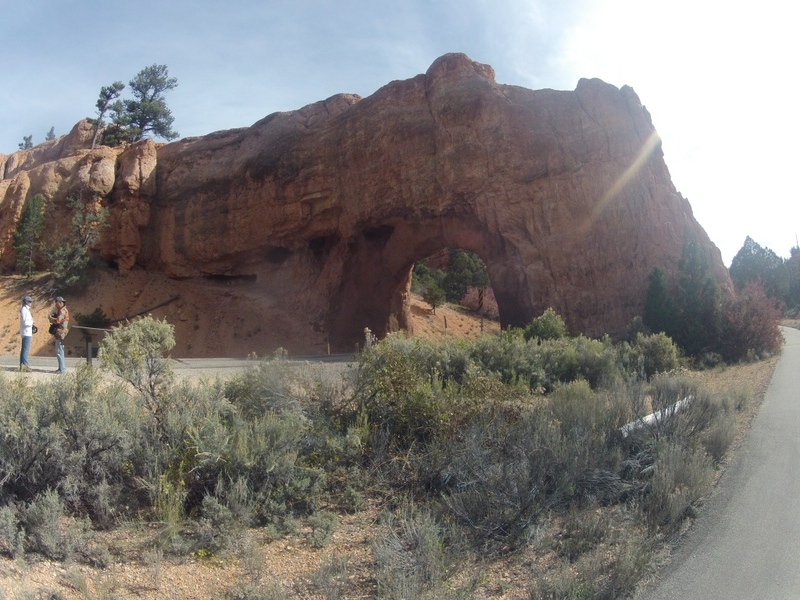 I’m actually writing this part of the blog here and will just add a few notes the next two days and upload the entry when I get to Flagstaff. Unfortunately, I had to change my route due to the government shutdown. 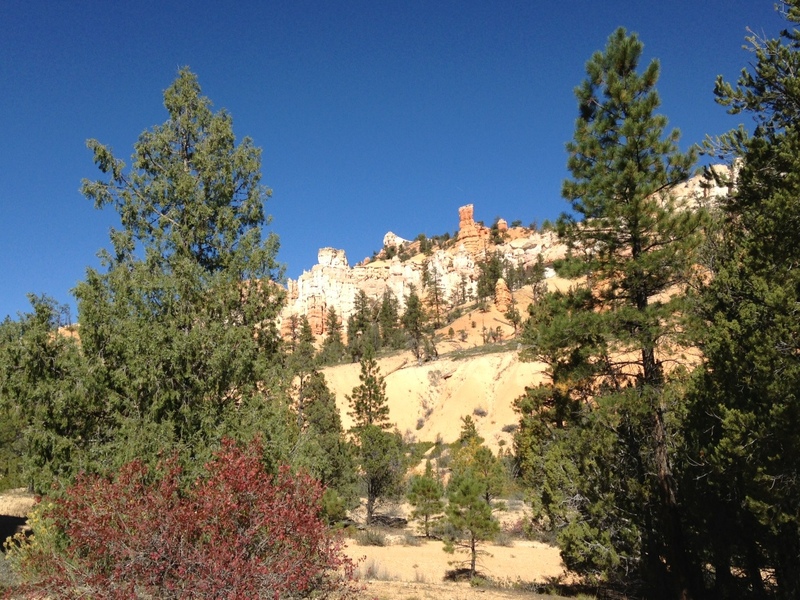 Cedar Breaks, Zion and the Grand Canyon are all closed since they are national parks and the politicians are still playing their stupid games. I already cut out Cedar Breaks and Zion and instead of going by the Grand Canyon, I will have to go via Flagstaff since they even closed the highway towards the Grand Canyon and don’t allow people in. Of course, it would have been nice to see these attractions, but I’m not too sad about it. Like I said before: I have seen so much stuff, met so many people and experienced a lot on this trip – I would have never done that on a normal vacation. 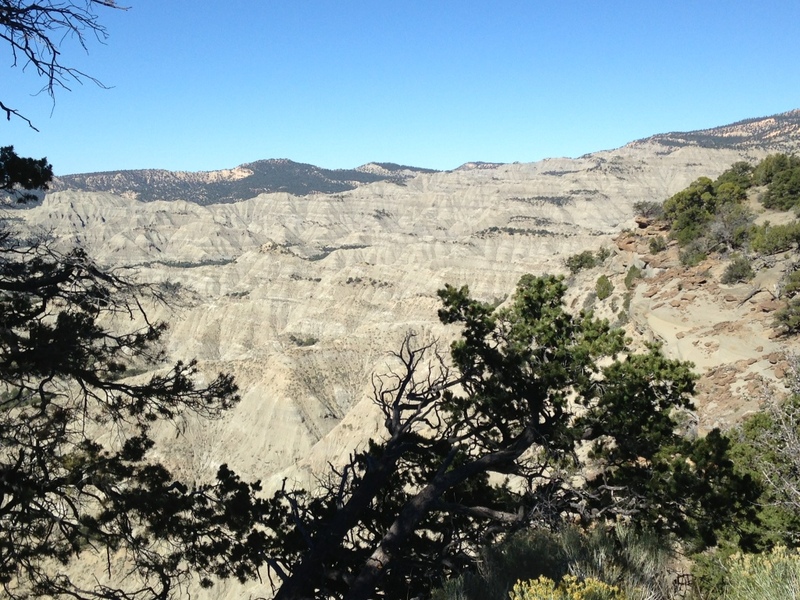 And I can always go back to the national parks…they won’t run away. I thought about it a lot and have come to the conclusion that my trip has been amazing so far without any major problems. If the government shutdown is going to be the main negative issue of this journey, I’m more than happy. Ok, this is the second and shorter part of this blog-entry. 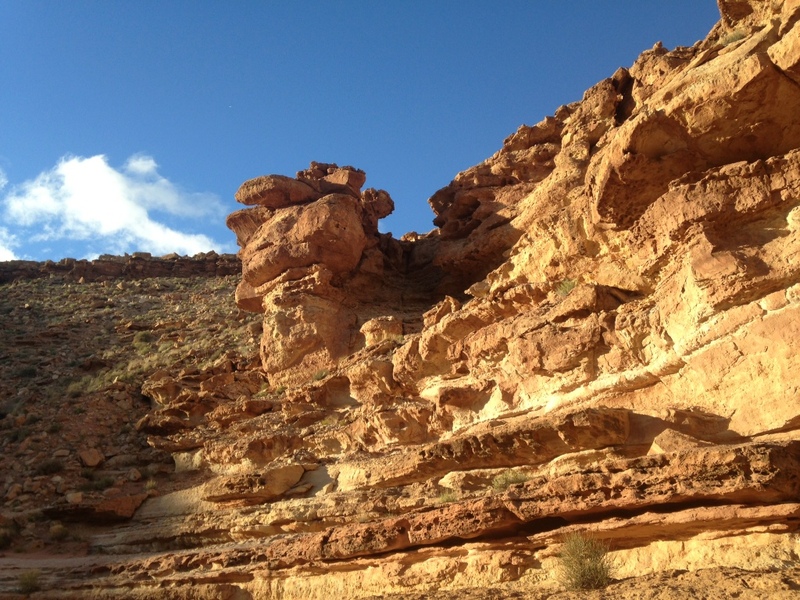 From Cliff Dwellings where I had stayed at Eran’s house, I had a long day ahead of me with a lot of climbing again. 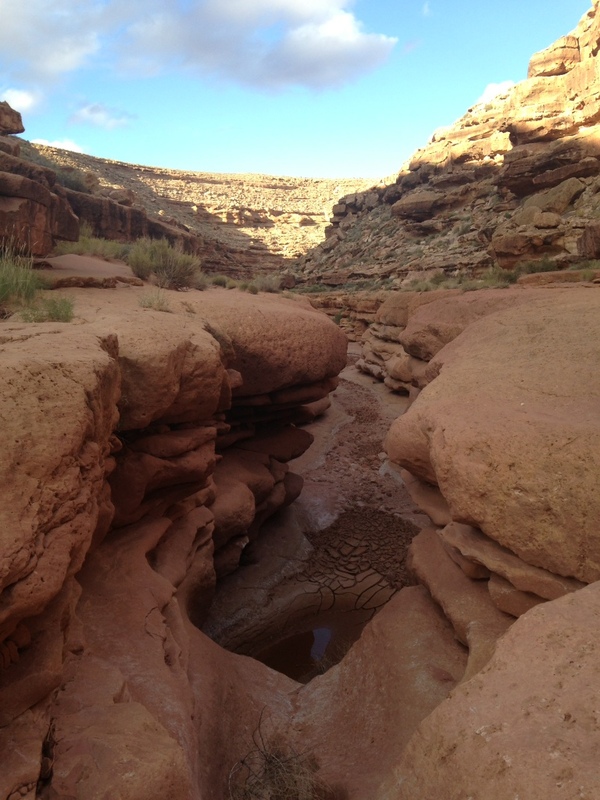 I left pretty early and after a few miles crossed the Colorado River on the old Navajo-Bridge. 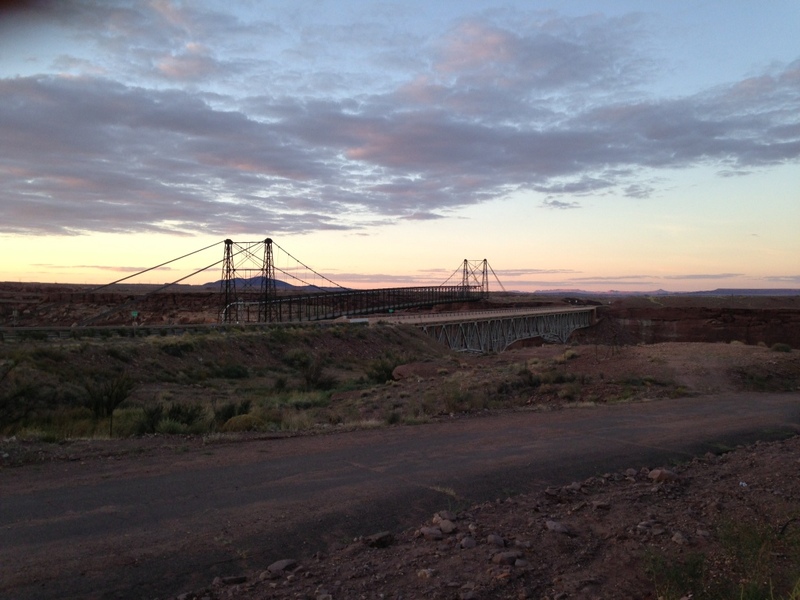 It’s only one of 7 bridges on a 700 mile stretch of the Colorado River. It also marked my entry into the Indian Reservation. I had heard different things about the reservation. Some people sayed it would be scary or sketchy, but I didn’t have any bad encounters – mostly because I barely had any encounters, I guess. 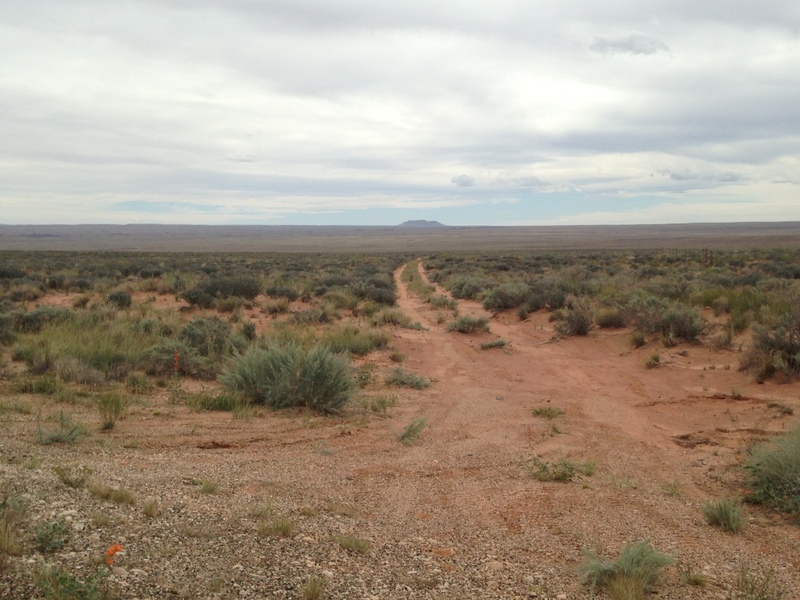 There weren’t a lot of people/buildings and it is probably true that the Native Americans got the land noone else wanted – desert. 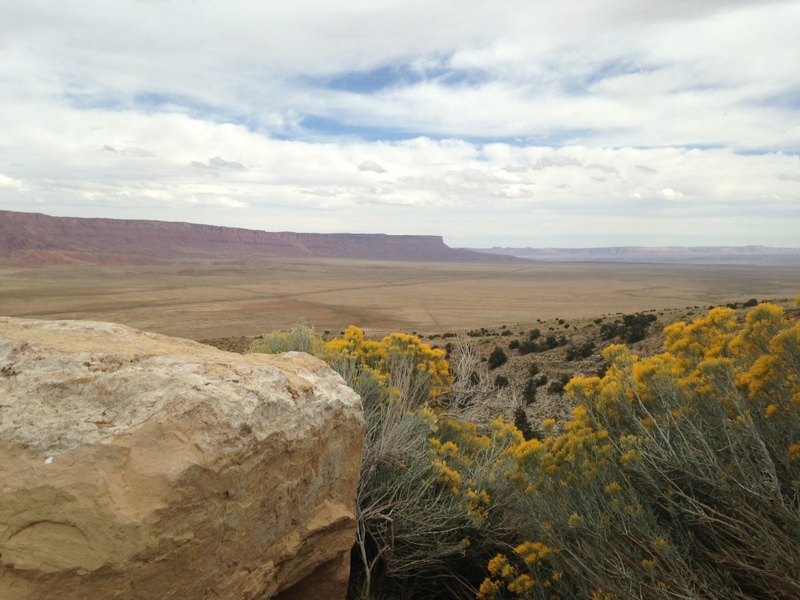 I wouldn’t want to live out there, but riding through it was amazing – I just really enjoy the color of the desert here. 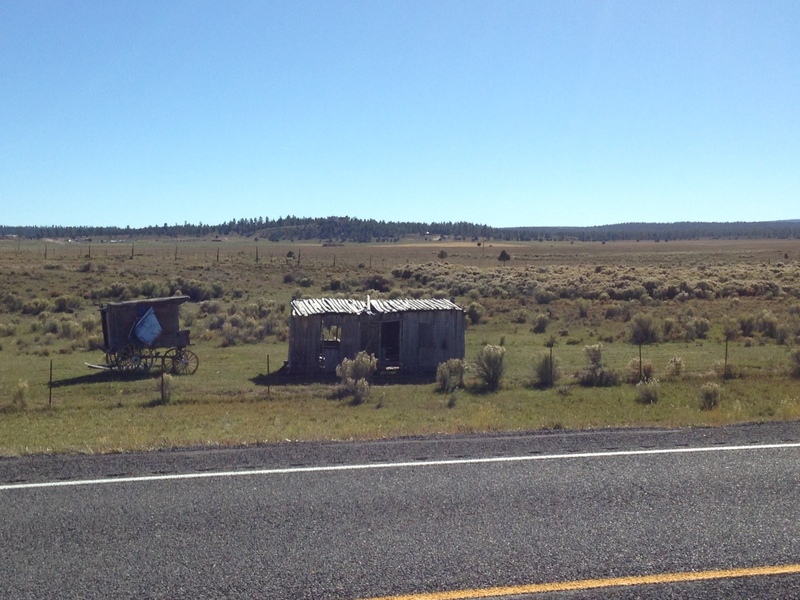 There was one little town/trading post around where you can actually buy some basic groceries. When I got to town, I saw another touring bicycle outside of the store and after a short while Pascal, a Swiss cyclist, came outside. 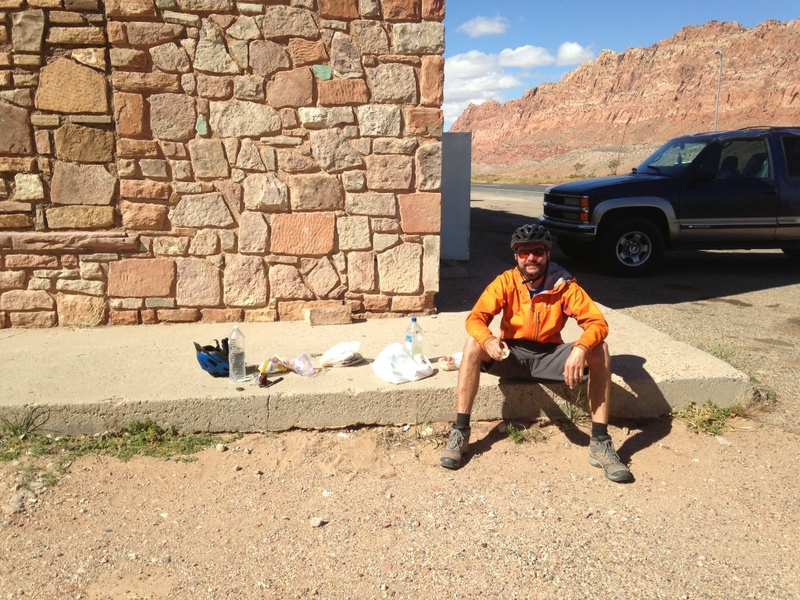 We were both happy to see another crazy guy on a bike in the desert and sat down infront of the store and talked for a long time and had lunch. Pascal is coming down from Vancouver and going all over the place. Eventually he will fly to Zanzibar and drive home to Switzerland with a friend in a van from Oman. He has done a bicycle trip from Switzerland to Tansania before and it was really interesting to listen to his stories! 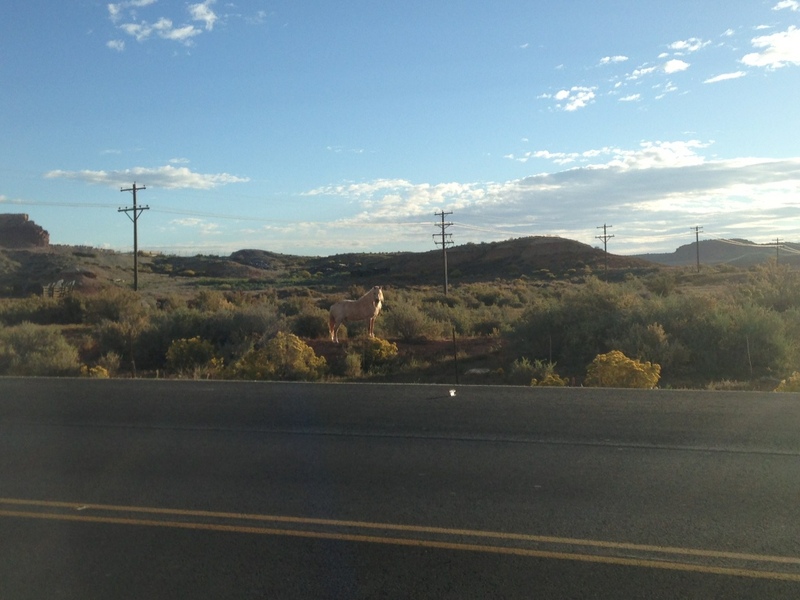 After lunch, I had to leave him though, because I still had 55km ahead of me and I didn’t even know what time it was (the state of Arizona doesn’t recognize Daylight Savings Time but part of the Indian reservation does – confusing!). After a long day, I finally got to Cameron. The last part of the day was not much fun with a lot of traffic on the highway, no shoulder and lots of broken beer bottles on the road. I was glad when I arrived at the Trading Post in Cameron and actually got to camp there for free – I invested the money I had saved in a delicious burger for dinner and went to bed in a good mood. The next morning, I got up at 6, packed everything, had breakfast and talked to some people at the trading post about the National Park Closure. 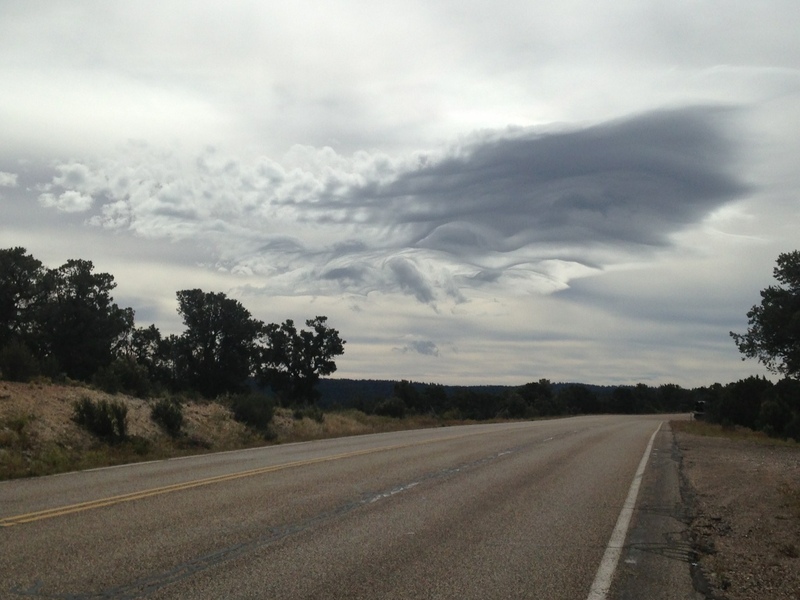 The road to the Grand Canyon was just one mile from there and they said there still wasn’t a sign of any updates. 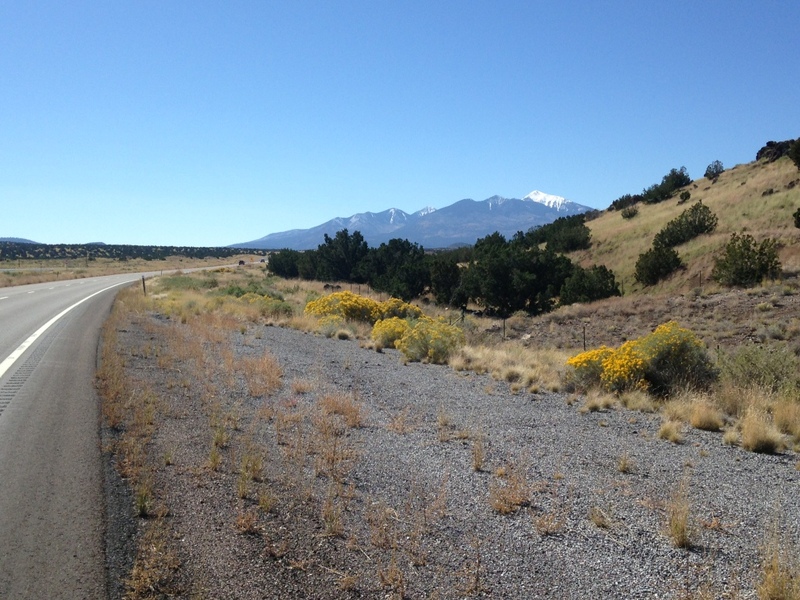 I therefore went south towards Flagstaff over another high pass and shortly before Flagstaff I had service on my phone again and saw 2 missed calls and a text from my parents saying that the Grand Canyon was open again. They must have opened the road right after I passed it, because the “Closed”-sign was still standing when I passed the road in the morning. Of course, it’s annoying that they re-opened it after I passed the road and of course I could do a detour of 200km and still go see it. 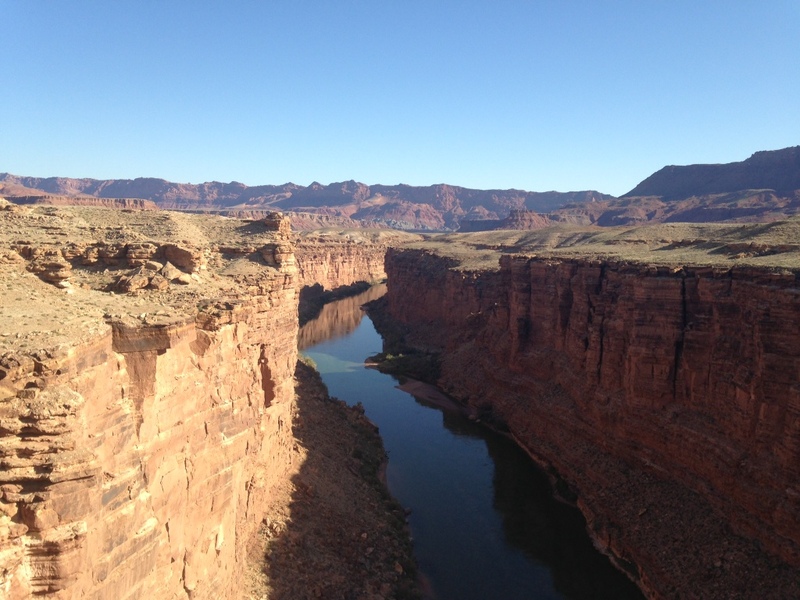 But the past 2 weeks I have been planning a great alternative route, got people to stay with for the next couple of days and rather come back some day to actually explore the Grand Canyon instead of rushing up there for one day just so I can say that I have seen it on this trip. Now, I’m at Ray’s place in Flagstaff. He used to be a professional bike mechanic and therefore my bike got a perfect tune-up and maintenance check and is now ready for the final part of the trip! I’m really excited that I have made it this far and looking forward to reach California, San Diego and then San Francisco. 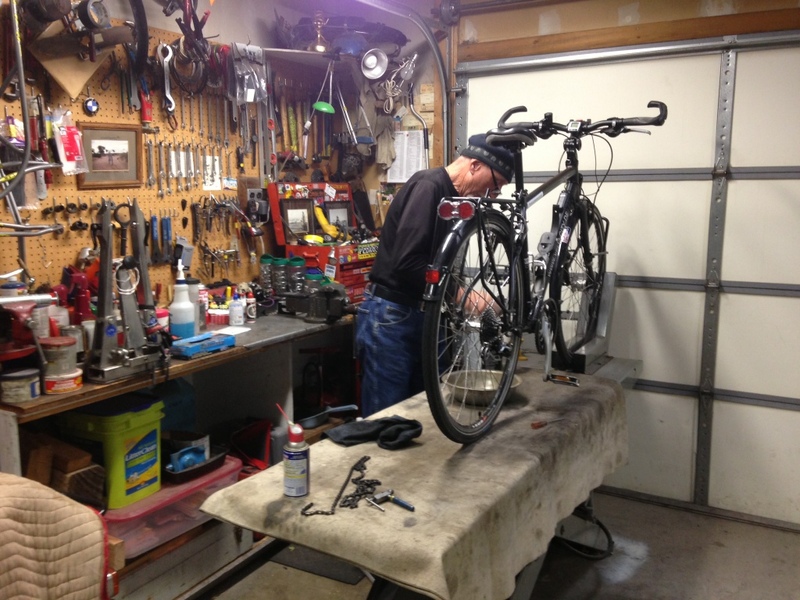 Ray working on my bike in his garage – the chain really needed some cleaning! Only about 9 days of riding until San Diego!!! Have a nice Sunday and hope you enjoyed the blog – realized it’s a lot of text, but I’ll try to add good pictures aswell. And thanks to all the people who have donated already for the good cause – but there’s still room for more! Hey! Great blog post–just thought I would let you know that we are in Blythe, CA and taking our time on our way to San Diego. You may just catch up to us yet!